On the way home from work Frances and Phyllis walk past a newsstand, Frances does a double take. FRANCES: Damn! 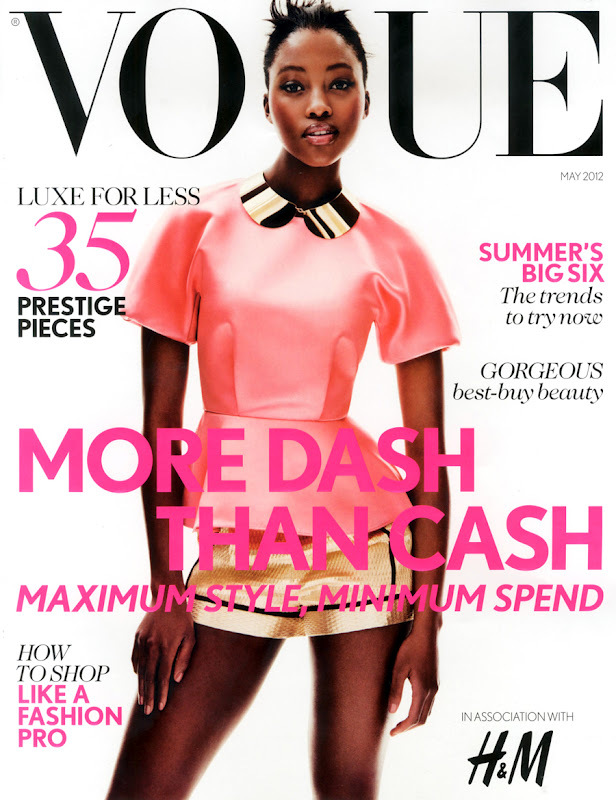 Did I just see top model Nyasha on the cover of Vogue? Phyllis looks quizzically at Frances. Frances is uncertain. PHYLLIS: Makes sense, Italian Vogue like to mix it up now and again, get in the exotic, warrior-like, greased up, black women in tribal jewelry/colourful make up/animal print/ block colours. FRANCES: But hold on, where’s the Italian? Frances squints visibly; she forgot to put in her contact lenses in her usual morning frenzy. FRANCES: Hmm yes, their editors do fancy themselves as a bit avant garde and aren’t black people still cool and exotic in Russia and Korea? PHYLLIS: Yeah that too, but they hate her in Blighty or at least the Daily Mail do, they LOVE her in Russia! PHYLLIS: They think phone throwing and beating up airline staff is like, FIERCE. FRANCES: Just like we think that having dimples, punching immigrant toilet attendants and being married to a philandering footballer makes you BRITAIN’S SWEETHEART. PHYLLIS: Besides, there are so few black people in Russia and Korea that it’s probably ok to put us on the covers of high fashion magazines. FRANCES: Yeah I suppose there’s no chance of us actually buying or wearing the clothes because there are no black people. PHYLLIS: Exactly! So the ‘pieces’ aka clothes will remain safely cocooned in aspirational prestige and won’t become “urban ” or “street” or tarred as stuff black people wear. FRANCES: Hmm but on balance, its so ‘out there’ that I think it’s probably Korean Vogue. PHYLLIS: Hmm we do all look the same to them. Remember when everybody in Korea thought you were Beyonce/Oprah/Janet Jackson? FRANCES: It was really cool, despite my protestations all these Koreans wanted to take their picture with me! I was drenched in a sea of adoration and envy! Frances begins posing melodramatically making camp diva gestures like Liza Minnelli. FRANCES: Fame was like a drug its pleasures orgasmic but fleeting! For ten days I felt like a star! Frances and Phyllis, both extremely short sighted, walk closer to the newsstand to closer inspect what the avant-garde Korean Vogue editor has in store for them. FRANCES: OMG! This is not Korean the writing is English! FRANCES and PHYLLIS in UNISON: They’ve spelt ‘colour’ properly! PHYLLIS: OMG its British Vogue! PHYLLIS: Even the almighty Beowulf aka Beyonce hasn’t had a British Vogue cover! A kindly old, unthreatening figure in white appears, he looks and sounds like Morgan Freeman and approaches Frances and Phyllis. PHYLLIS: I saw that one; she was styled like a somewhat constipated looking and sunburnt Marilyn Monroe. Kindly old Morgan Freeman lookalike gives Phyllis a withering look; he is not pleased that he has been interrupted. He clears his throat. KINDLY OLD MORGAN FREEMAN LOOKALIKE: It goes without saying that unlike their white counterparts, black models hardly ever make the cover of British Vogue. To be a black Vogue cover girl you’ve got to sell out arenas and/or have a blockbuster movie as well as have a major cosmetics or fashion contract; failing that you need to be Naomi Campbell. FRANCES: Yeah, its’s common knowledge that Naomi Campbell has to retire or die before another black model gets a look in at British Vogue. Both kindly old Morgan Freeman lookalike and Frances guffaw. PHYLLIS: You shouldn’t laugh; we’ve all been proved wrong! We were such cynics! Morgan Freeman lookalike and Frances look sheepish. FRANCES: Yes you’re right, the world is not so black and white! This sudden proclamation prompts a Damascene realisation for Frances, Phyllis and kindly old Morgan Freeman lookalike. IN UNISON: Perhaps we do live in a post-racial society! This realisation is without a snort of irony. Frances picks up Vogue and classical music begins playing. FRANCES: I can’t believe I used to joke that it was called the Style Bible, because like the other Bible there are no black people in it, or they are shoved somewhere in the middle where everyone skips over.I was wrong about you Ms Alexandra Shulman, you don’t just write tokenistic, publicity- whoring letters, pretending to be very cross with designers for using really hungry malnourished teenagers. PHYLIS: Yeah, you are actually down with the sisters, damn it! Now you are an honourary sister! KINDLY OLD MORGAN FREEMAN LOOKALIKE: You, the grand priestess of British fashion, in all your infinite wisdom and kindness have put a top black model on the cover of the holy fashion grail. You proved those fashion haterz wrong, the lies they spun saying that there can only ever be one top black model at any one time, otherwise a curse will be unleased and all the fly models in the world will turn into size 16’s. You did it; you proved those haterz wrong; the world’s models are still protein shaking it to size 0! FRANCES: This is epic, I’m going to dig out the last fiver in my wallet and get me a piece of this divine ‘fashpiration’! PHYLLIS: Well not quite the back, Nyasha is on the cover of the H&M fashion supplement that accompanies this month’s Vogue. FRANCES: Wow who knew that Vogue even DID H&M? PHYLLIS: Well they do have a really posh H&M in Selfridges that sells fifty-pound polyester tops that you can get in Primark for a tenner. FRANCES: But isn’t H&M mass-produced and COMMON? PHYLLIS: That’s the pro-Tory, Murdoch press for you. All four of them stare at the cover; Charlize Theron stares back smizing (smiling with her eyes), WASPish, coiffed like a Stepford wife. Frances stuffs her fiver back into her wallet. IN UNISON: Fashion is black and white.